Meals. I already mentioned the seating arrangements and the tricks we used to get Theo occupied (cars) and clean (long-sleeved bibs). So I’m going to talk about, uh, something else I guess. Every other cruise I’ve been on has one giant dining room for the main meals. Disney has 3 less giant ones. They are Triton’s, which serves somewhat French food, Animator’s Palette, which serves a contemporary variety, and Parrot Cay, which serves an island flair type thing. You keep your same table mates (although our table mates ended up switching to the early seating so we just ate by ourselves, which was actually kind of nice) and your same wait staff and rotate among the three restaurants. Our rotation was Triton’s, Animator’s, Animator’s, Parrot Cay, Triton’s. I have to say that I thought the food at Triton’s was the weakest. The bummer was that we ended up eating there twice and missing one of the Animator’s, which had this awesome show with Mickey Mouse running around. That was because there’s also the adult-only special restaurant, Palo. I personally love the cruise special restaurants. You pay extra but the food is usually amazing and the individual seating is a nice break. I didn’t originally plan on eating at Palo because it didn’t occur to me that you can have your kids in the nursery until 10pm, but once I realized that I ran over to the Palo desk upon boarding and got us a reservation, along with a reservation for Theo at Flounder’s Reef (the nursery). I also had to adjust our spa treatment, and the best part was that the person I talked to on the phone to make all these arrangements ended up putting none of them (aside from Palo) into the computer, so we’d show up at the spa and Flounder’s and they’d be like “Well, we have you scheduled for…” Fortunately they were able to fit us in everywhere, and the moral of the story is to make sure all of your arrangements are set with each individual place. Anyway, another thing I didn’t know about was that there’s a Pirate Night onboard. One thing that bugged me a bit about the Disney site is that they give almost no information beforehand. You have to look at other sites or have a knowledgeable travel agent or both to get this kind of information, and the fact that there’s a pirate night is a pretty big piece of info I wish I’d had. But what can you do? Except not make your Palo reservation on Pirate Night like I did. Oops! Ah well, live and learn. We did not, however, miss semi-formal night. Okay, yeah, technically it was SEMI-formal night. 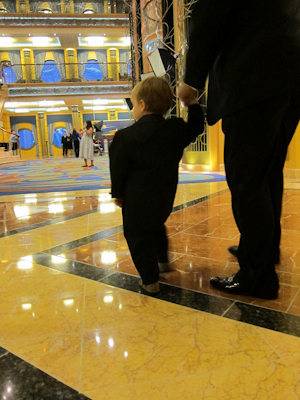 But I bought the tux for Halloween (Theo is going as Tuxedo Mickey which is pretty much going to skyrocket the Cute Chart all the way to the top) and I love dressing to the nines anyway. 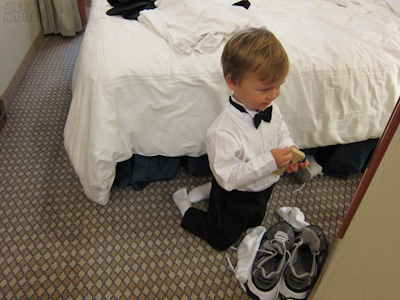 Plus Kevin owns his own tux (did I mention dressing to the nines?) so I turned semi-formal night into formal night. 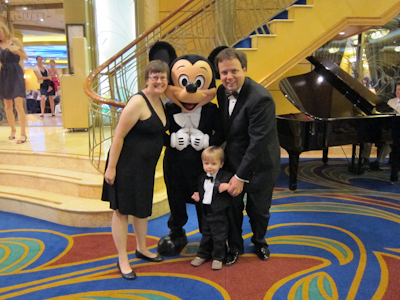 Our (semi) formal night was in Parrot Cay, and was definitely my favorite meal of the trip (aside from Palo). But did I mention Palo’s chocolate souffle? Oh em gee, I am always a HUGE fan of souffle, but I’ve never had a chocolate souffle like the one at Palo. I’ve heard that they’ve gotten awards or something for this dessert and quite frankly, they deserve every single accolade. I mean, it was GOOD. But back to (semi) formal night. There were different stations set up where you could take family pictures every night. I decided that it would be fun to have a family shot of the all of us, esp. 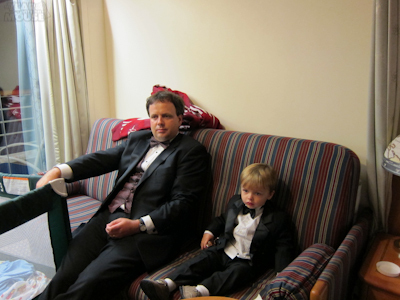 the boys in their tux, so we had a few done against a white background. 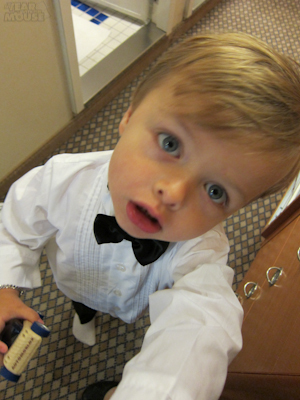 One in particular was so adorable and so completely caught Theo’s personality that we had to buy a few prints for fun. Meanwhile, it was great to try to catch some moments of my favorite guys. Theo’s like an Ambercrombie and Fitch ad with his hand in his little pocket there. We ended up timing our photos just right, so we didn’t have to wait for the family picture and only had to wait a few minutes for Mickey. However, this did leave us some time to relax back in the room before dinner. I just love these pictures because even though we hadn’t had dinner yet, it still looks like the guys just got back from a night of dancing or a wedding and are exhausted. 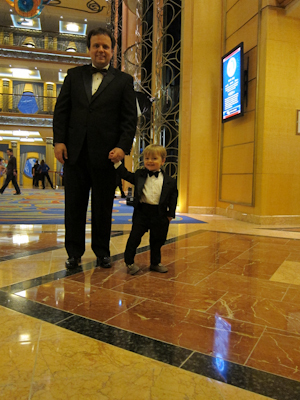 All in all, our dinner experiences were fantastic and our (semi) formal night was one to keep for the ages! Oh, and stay tuned tomorrow! I’ve got a giveaway that I think you’re going to like!!! 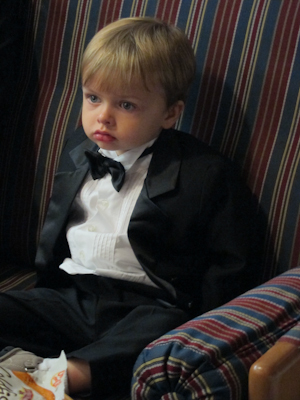 Such great pictures, and yes, Theo in that tux is stinkin’ adorable. Thank you! We think so too ;). There’s definitely a lot to do for adults! I don’t think he’d be bored. We had a tougher time because Theo was too young to do the independent kids’ activities, so we had him with us and spent our time doing family stuff (and napping!) but I think you will have a great time. Shelby, don’t worry that you missed something by not having two visits to Animator’s Palate. They only do the show the first night.